As the liberal flank celebrates its sudden ascendance, others wonder if the Democrats are veering so far left they're about to fall off a cliff. WASHINGTON — What is happening to the Democrats? Captivated by a handful of liberal superstars, they are venturing where the party has long feared to tread: Steep taxes on the rich. Abolishing an immigration enforcement agency. And proposing a sweeping Green New Deal that calls for an "economic transformation" to combat climate change. "The Amazon New York fight is an illustration of how power is moving to the left," said Ben Wikler, of the liberal group MoveOn. "One of the world's most powerful organizations doesn't want to pick a fight with progressive activists." As the liberal flank celebrates its sudden ascendance in the party, energized by the new House freshmen pushing the party toward bold policy solutions, others wonder if the Democrats are veering so far left they're about to fall off a cliff. It's a valid question ahead of a presidential primary season with an unusually robust roster of contenders trying to wrest the White House from President Donald Trump. The race comes at a time of shifting party loyalties and eroding confidence in traditional corridors of power, a dynamic that has recast the policy prescriptions of both parties. The big questions for 2020: Will Democrats move beyond the center-left policies that have dominated the party since Bill Clinton's presidency? And if so, will they find the electorate is repelled, as Republicans claim, or will they discover that a country long described as "center-right" is receptive to a return to liberalism? Democratic pollster John Anzalone said the leftward lurch that's playing out in the Amazon fight wouldn't necessarily hurt the party heading into 2020 and could resonate with voters. "When you're doing corporate giveaways, whether for a big company or a sports team, it's not as cut-and-dry as most people think," Anzalone said. "The fact is there tends to be a belief that these big corporations have a lot of money and use their power to get deals they don't need." A spokesman for former New York City mayor Michael Bloomberg didn't respond to a request for comment. Howard Schultz, another business-minded former Democrat who's now weighing an independent bid for president, also declined to comment. "The people of New York and America are increasingly concerned about the power of large multinational corporations and the billions in corporate welfare they receive," Sanders said in a statement. "Our job is to end the race to the bottom where taxpayers in one city or state are forced to bid against each other for desperately needed jobs. This is what the rigged economy is all about." Warren tweeted: "One of the wealthiest companies on the planet - just walked away from billions in taxpayer bribes, all because some elected officials in New York aren't sucking up to them enough. How long will we allow giant corporations to hold our democracy hostage?" And Gillibrand said, "Walking away so quickly shows that Amazon was interested in the taxpayer assistance and not being a good neighbor in Queens hiring the greatest workers in the world." As liberal activists across the country welcomed Amazon's decision as a fresh demonstration of the increasing power of the Democratic Party's far-left wing, Republicans highlighted the same thing, using the situation to cast the modern-day Democratic Party as extreme. Following Trump's lead, they pepper their speeches with claims that Democrats are veering toward socialism. 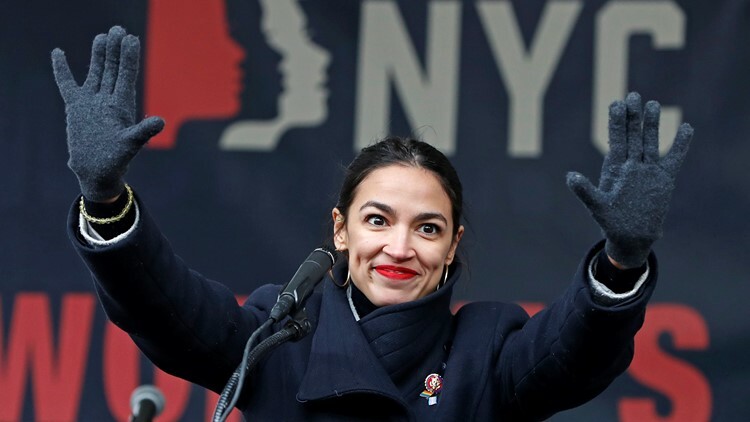 "Now, thousands of #New Yorkers will be deprived of good paying jobs at #amazon because of socialists like @AOC - and unfortunately the promise of a #greenjob won't pay the bills," former Trump aide Sean Spicer said on Twitter. On Capitol Hill, it's hard not to compare the arrival of Ocasio-Cortez and the emerging Democratic divide to the tea party class of 2010 that took control of the House and pushed the Republican agenda rightward, ultimately helping give rise to the politics of Trump. It's not just Ocasio-Cortez. She and House colleagues — Reps. Ilhan Omar of Minnesota, Rashida Tlaib of Michigan and Ayanna Pressley of Massachusetts — jointly announced their opposition to the bipartisan border security deal. They want to cut the Department of Homeland Security's budget over the administration's deportation policies, including those that separated families at the border. The four lawmakers were urged on by activists outside the Capitol, protesting what's seen as ICE's unnecessarily harsh deportations and raids against immigrants here illegally. Omar, who is Muslim-American, pushed the party further into conflict this week with comments about Israel that were widely seen as anti-Semitic. She apologized. But the questions she and others are raising about the longstanding U.S. ally reflect a growing unease among some Democrats with Israel's treatment of Palestinians. House Speaker Nancy Pelosi says the Democratic Party's diversity in the House is its strength, as evidenced by the way her caucus held unified against Trump's demand for money from Congress to build the wall on the border with Mexico. "Welcome to the Democratic Party," Pelosi said Thursday. "We are not a monolith, never have been. And who would want to lead a party that would be described that way?" This week, when the Republican leader of the Senate, Mitch McConnell, announced an upcoming vote on the Green New Deal climate change plan as a way to force Democrats into an awkward vote, the Democrats responded, "Bring it on." They say Americans want answers on climate change, and Republicans have none. "Anything is possible," Ocasio-Cortez tweeted Thursday, "today was the day a group of dedicated, everyday New Yorkers & their neighbors defeated Amazon's corporate greed, its worker exploitation, and the power of the richest man in the world."